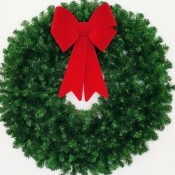 Click here to be notified when the Deluxe Traditional Christmas Wreath is available. Click here to be notified when the Holiday Bake Shop Wreath is available. 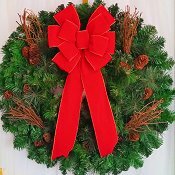 Click here to be notified when the 3 Foot (36 inch) Christmas Wreath (without lights) with Large Red Bow is available. 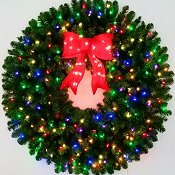 Click here to be notified when the 3 Foot (36 inch) Inc. Christmas Wreath with Pre-lit Red Bow is available. Click here to be notified when the 3 Foot (36 inch) L.E.D. 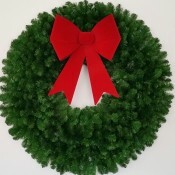 Christmas Wreath with Pre-lit Red Bow is available. Click here to be notified when the 3 Foot (36 inch) Color Changing L.E.D. Prelit Christmas Wreath with Pre-lit Red Bow is available. 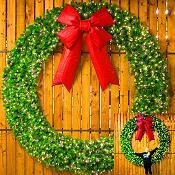 Click here to be notified when the 3 Foot (36 inch) Christmas Magic Wreath is available. 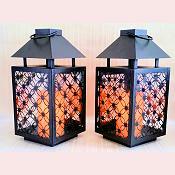 Click here to be notified when the 3 Foot Multi Color L.E.D. 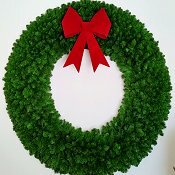 Christmas Magic Wreath is available. 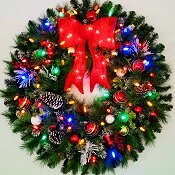 Click here to be notified when the 4 Foot (48 inch) Christmas Wreath (without lights) with Large Red Bow is available. 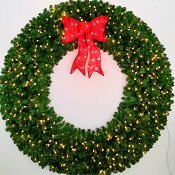 Click here to be notified when the 4 Foot (48 inch) Inc. Christmas Wreath with Pre-lit Red Bow is available. Click here to be notified when the 4 Foot (48 inch) L.E.D. 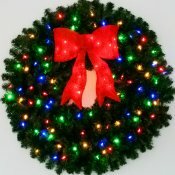 Christmas Wreath with Pre-lit Red Bow is available. Click here to be notified when the 4 Foot (48 inch) Multi Color L.E.D. 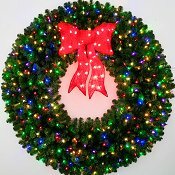 Christmas Wreath with Pre-lit Red Bow is available. 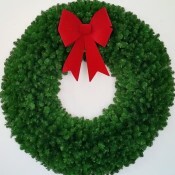 Click here to be notified when the 4 Foot (48 inch) Christmas Magic Wreath is available. 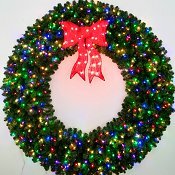 Click here to be notified when the 5 Foot (60 inch) Christmas Wreath (without lights) with Large Red Bow is available. 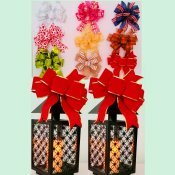 Click here to be notified when the 5 Foot (60 inch) Incandescent Christmas Wreath with Pre-lit Red Bow is available. Click here to be notified when the 5 Foot (60 inch) Multi Color L.E.D. 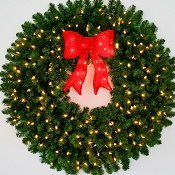 Christmas Wreath with Pre-lit Red Bow is available. 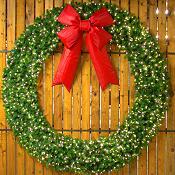 Click here to be notified when the 6 Foot (72 inch) Christmas Wreath (without lights) with Large Red Bow is available. 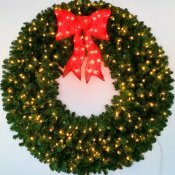 Click here to be notified when the 6 Foot (72 inch) Incandescent Christmas Wreath with Pre-lit Red Bow is available. Click here to be notified when the 6 Foot (72 inch) L.E.D. 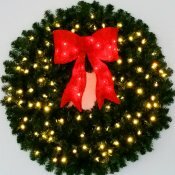 Christmas Wreath with Pre-lit Red Bow is available. Click here to be notified when the 8 Foot (96 inch) L.E.D. 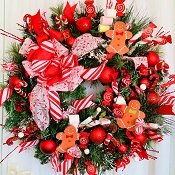 Christmas Wreath with Large Red Bow is available. Click here to be notified when the 10 Foot (120 inch) L.E.D. 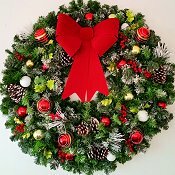 Christmas Wreath with Large Red Bow is available. Click here to be notified when the 12 Foot (144 inch) L.E.D. 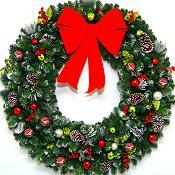 Christmas Wreath with Large Red Bow is available.